For The First Time at INDULGE on 17th of September 2011. 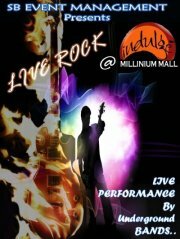 Live performances by some of the best upcoming bands in Karachi. -- FREE Fast Food & Drink will be Provided (on PASS). -- Sheesha Also available at the venue. -- Eatables from outside are not allowed..
limited passes so grab em quickly cux u'll be sorry to miss it ! !